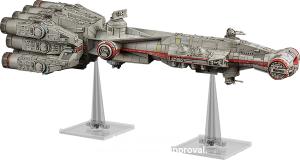 Fantasy Flight Games has announced that there will be new large-sized ships for the X-Wing miniatures game including the Rebel Transport and the Tantive IV. These are exciting times for X-Wing™ fans! The Rebel fleet was not comprised of fighters alone. Pilots like Luke Skywalker may have struck decisive blows in many of the Rebellion’s greatest victories, but they relied upon the support of the freighters, transports, frigates, and other capital ships that comprised the rest of the fleet. Soon, X-Wing fans will be able to better reflect this fleet diversity.